Cashback Reward : Earn up to 54$! 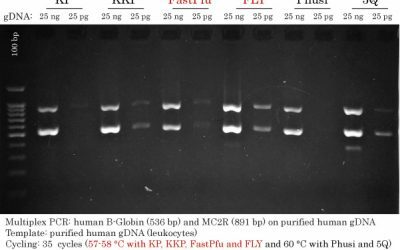 EasyTaq® DNA Polymerase for PAGE is purified from E. coli expressing a cloned DNA polymerase from Thermus aquaticus. The enzyme consists of a single polypeptide with a molecular weight of approximately 94 kDa. EasyTaq® DNA Polymerase for PAGE has 5′-3′ DNA polymerase activity and 5′-3′ exonuclease activity. lt lacks 3′-5′ exonuclease activity. 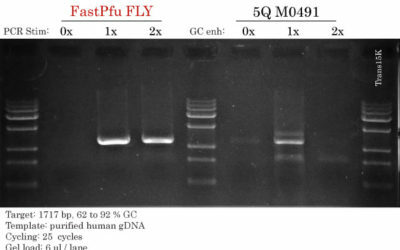 This enzyme is supplied with an unique buffer formulation without BSA, therefore its PCR product is suitable for use in SDS-PAGE and agarose gel electrophoresis. Template-independent “A” can be generated at the 3′ end of the PCR product. PCR products can be directly cloned into pEASY®-T vectors. Available with or without 2.5 mM dNTPs.